As we all know TMDBrassman has gotten into the VSL. What we as a community need to do is try and find away to get him to play ratsqueeze in the VSL. Any Ideas? Is it possible to make brassman the host of the skype chat? If so, then he can just kick the other commentator and hoax the stream and play ratsqueeze over the commentary. No, we need Andy to win. Steve has been doing a terrible job and now look where it's gotten him. We need Andy to win for the sake of the community and our restricted list. We need Vintage joes to replace all of the pros. @shawnthehero oh shaddap. He won Season 1. @boggyb All respect to Steve (a great great player and Mtg scholar)... but man, be more diverse in your deck choices. If he showed up with a Shops deck tailored to a Shops mirror, he would catch people so so unprepared, since that tourney is so much about guessing what the opponent is going to be on. People take one look at Steve and go, something with Gush... or some tendrils kill thing that may or may not involve Oath, so pack in the Sphere effects and we're good. I would love to see Steve drop some hard Landstill action onto some Shops variants... or Dredge with crazy artifact removal. Or Hatebears tailored to the meta... something totally bonkers and surprising. I think the answer is pretty obvious: offer a bounty for every time a card gets cast. Eg. I hereby pledge $5 to TMD for every time Andy or Steve casts Earwig Squad in the VSL. This means you're not on Painter. I secretly hope you bring the good old timetwister galvanic blast robots. @Brass-Man Do what you have to in order to win man. You can do it! I BEREEEVE IN YOU!!!!! Seriously though, just find your center, and you will overcome. 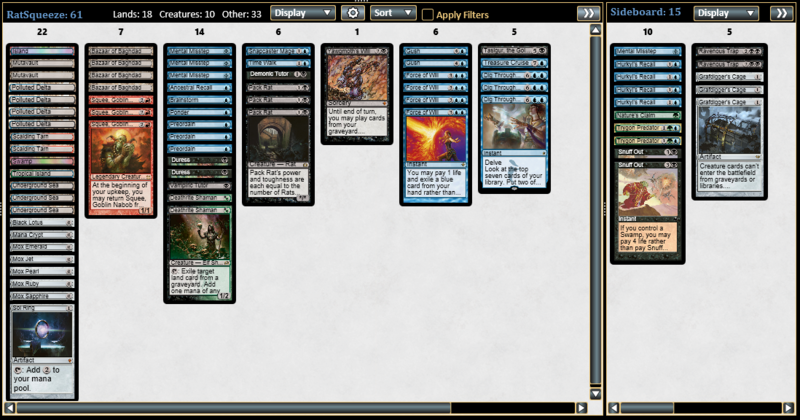 OR, you could be cool like the time we swapped decks before a scg power 9 and you top 8'd with my 5c stax list. And I went x-2 with your gifts ungiven! one course of action will garner more respect than the other, obviously. It would be so cool for the result to be 5 Vintage pros in the VSL. If Steve's not in it though, I will be very sad indeed. @EwanMcCartney Do you have a list posted somewhere? This version isn't legal anymore but it should give you a general idea. @wfain it's a web-based picture.